When I attend trade shows, I am often asked if it is necessary to fill out our VSI or Vehicle Suspension Information form. Although the form typically takes 10 minutes to fill out, most people miss the importance of what they consider an “extra” step. Some believe that the VIN number or a description of the suspension should be enough. My favorite, however, is when people tell me the vehicle is a “sister” to one already fitted with Onspots so there should be no need to measure the chassis. This statement could not be more further from the truth. The measurement sheet is the key component to the build process of the Onspot automatic tire chain system. This form allows us to engineer a specific set of mounting brackets for the customer’s vehicle as well as determine what chain set will be used for the application; eliminating any guess work. When a customer receives the Onspot system for their specific vehicle, they will receive everything needed to install the system – no more, no less. In other words, there is no engineering needed to be done by the customer. 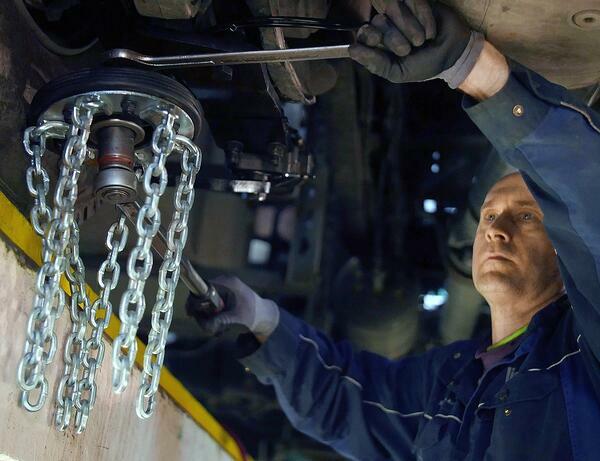 Other automatic tire chain companies may or may not have you measure the vehicle. In either case, their process is not as focused, so the customer is required to perform some sort of engineering on their end. This could mean dealing with a universal mounting bracket system where it is up to the customer to sort through a box of extra parts and pieces to figure out the best possible setup. Even if the system comes with a “custom setup,” it may still be limited on where and how it operates. At Onspot, our commitment to a more engineered system means we fit the most applications of any automatic tire chain manufacturer. We accomplish this through the development of hundreds of different chain systems and thousands of mounting bracket kits as we are always working with OEMs to fit the latest chassis. Last, but certainly not least, we always consider what the vehicle will be doing in its lifetime. For instance, is the Onspot system for a fire truck that sees limited hours or an over the road truck which see thousands of miles. In these and all cases, Onspot offers a system engineered to fit your specific needs. Follow the links below to find out more about Onspots and the measurement form.